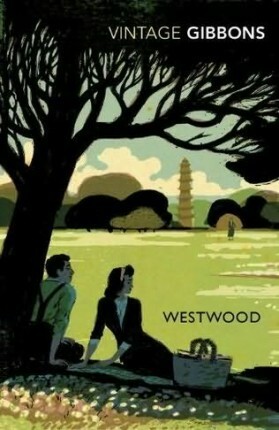 Westwood, written by Stella Gibbons in 1946, has been one of the more delightful reads I've had in a while. Gibbons is possibly best known for Cold Comfort Farm, a book that my mother absolutely adored, which I read and could see why she loved it, but it never did a lot for me. I'd not come across other works by this writer - apart from Cold Comfort Farm sequels, which didn't appeal - until I was beguiled by the lovely cover art of this Vintage paperback edition. I picked it up at the bookstore down the road from my office and had started reading it during the madness of my last couple of weeks at work - believe me, the pre-Christmas lead-up at a big, busy city church is completely insane! I had no expectations, really, just a hope - from the blurb - that it might give me something peaceful and elegant as an antidote to the chaos. That chaos moved from work to a house full of family for a week, and then the quiet bliss of time away with DB and I've only just got back to the novel to finish it. It is set in wartime London and tells the story of a young teacher, Margaret Steggles. She is plain, introverted but passionately sensitive, and according to her mother, 'not the type that attracts men.' Her school chum, Hilda, is the opposite - bright, light-hearted and vivacious, and busily engaged with a vigorous social life with the many servicemen she encounters. On a walk over Hampstead Heath, Margaret finds a dropped ration book - it belongs, she discovers, to a member of the Challis family - Gerard, a famous playwright; Seraphina his socialite wife; Hebe and Alex Niland, his daughter and her painter husband; Hebe's children; Grantey, the family retainer/nurse/housekeeper who gravitates between the Challis and the Niland households as needed; Grantey's brother Cortway, chauffeur/ handyman/gardener; and Zita Mandelbaum, a Jewish refugee who lives in and helps with cooking, housework and sewing. All of Margaret's idealised notions about the lives of great writers and artists are galvanised and she wishes for nothing more than to have access to the great house, Westwood where the Challises live. She is able to introduce herself by restoring the ration book to Hebe, and finds herself, willy-nilly, drawn almost immediately into the family's lives by arriving just as Hebe is poised to leave for a social engagement, but is held up by Grantey being late arriving to babysit. Deciding Margaret looks trustworthy, she thrusts the children at her, reassuring her that Grantey won't be far off, and departs. Far from being affronted - as anyone else might justifiably may have been, Margaret sees it as a heaven-sent opportunity, if a little unexpected. Little by little, Margaret is drawn into the bohemian, and at times, bewildering lives of her idols. Welcomed for her practical good sense and assistance at times of varying crises - a broken fuse just before a party during Cortway's absence, babysitting when Hebe and Alex's house is bombed, and again when Grantey is ill - she continues to put herself forward, despite her inherent shyness, in the hopes of seeing Gerard, whom of all the family, she cherishes the most idealised view and for whom she forms a profound crush. She is laughed at behind her back - overhearing a number of jibes - by many in the family, who have dubbed her 'Struggles' for her seriousness and obviously star-struck emotional involvement. Partly, she feels she deserves their contempt - her mother's conditioning has reinforced her inherent sense of inferiority and plainness - but growing familiarity, which starts to show her the fallibility of her idols also begins the process of her beginning to understand that they are not the perfect beings she originally thought them to be, and she is not as insignificant a creature as they clearly assume. Meanwhile, Hilda, in the depths of a late night fog, is assisted home from the tube by the elegant and chivalrous Gerard - introducing himself merely as 'Marcus' - who is much taken by her delicate prettiness which he encounters just at a critical point of writing his new play. She becomes for him his muse, upon whom he begins to remodel his heroine. His view of Hilda is as unrealistic as Margaret's view of Gerard. Hilda, a very normal, healthy young woman who doesn't lack for male attention, finds him a little odd, and sometimes tedious, but quite enjoys the dinners, movies and other dates they share every three weeks or so. He continues to build his fantasy around her while she is blithely unaware - skating, as she does, but lightly along the course of male/female interraction, refusing to take his - to her - exaggerated protestations of her perfection, beauty and inspirational qualities seriously. As Westwood and its inhabitants gradually eat into Margaret's scanty spare time, and Hilda - who finds Margaret's intensity a little trying - moves away from her a little, both situations continue develop without either girl being aware of the involvement each have with Gerard Challis. Inevitably, things come to a head but not before Margaret has had a number of opportunities to come more out of herself and begin to see that she needn't be condemned to the fairly colourless existence that she once felt was her destiny. This is a gently paced, and very lovely read. There is a blog I follow, Book Snob, written by a young English woman, who has a taste for vintage British fiction, often by quite obscure authors, many of whom I've never heard of (but am now in the process of hunting down!) and this book made me feel, at times, that I'd stumbled onto the kind of novel that I read about so often on her blog. There is a sense of timelessness in the style of Gibbon's prose, a classic elegance, that slows down the reading process. I am a great gobbler of books - particularly the first time I read them. If I've really loved a new book, I'll go back to the beginning and re-read it through more slowly - mad, I know! Westwood demands that every word be read, every nuance absorbed, every detail be understood, before moving onto the next bit. Having said that, it doesn't drag, the slower pace never felt like a chore - I found myself viewing the thinning number of pages as I got closer to the end with dismay, because I didn't want it to end. And now that it has, I really want to know what Margaret did with her newly discovered view of herself and the things she'd learned through her relationship with this very self-indulgent and quite pampered family. The statement on the back cover from a Times review, that 'Stella Gibbons is the Jane Austen of the twentieth century', is not unwarranted based on my reading of this book. It is very much the story of people's everyday lives, their concerns - big and small - preoccupation with where they fit in the social structure, and also with its examination of differing moral viewpoints. There is also a similar gentleness made lively by the pithy observations Gibbons makes of her characters. Margaret is saved from being too prim and prissy by having a healthy temper which, when pushed, results in her delivering some delightfully caustic one-liners, and also by the awareness she has of her own intelligence, which often puts her at odds with her disgruntled and disenchanted mother - not unlike Elizabeth Bennet in Pride and Prejudice. It's always nice to be pleasantly surprised by a book. It was, as I said, the cover that first made me pick it up off the shelf, and it also only cost me something around $12, and at just on 500 pages, was going to potentially offer me a solid read - and was SO over re-reading at that point, having been so good for so long about not going into bookshops - and have been reasonably bad since...! However, I am not sorry I succumbed to temptation this time, and I can heartily recommend this book to anyone who has a liking for Austen, because I think the parallels are quite obvious, but also to anyone who enjoys period fiction, particularly the WWII period. Sounds like one I'd enjoy reading. Thanks for sharing.